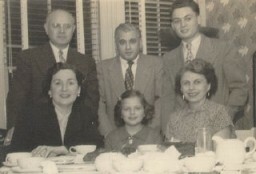 In 1933, just after Hitler and the Nazi Party came to power, Thomas's Jewish parents moved from Germany to Czechoslovakia. Thomas's father had worked as a banker in Germany, and then bought a small hotel in the Slovakian town of Lubochna. Many of his father's friends in Germany came to Czechoslovakia to escape the Nazi government's unfair policies and stayed at the hotel. 1933-39: Slovak soldiers who had sided with Hitler took over the Buergenthal family's hotel in late 1938. They fled to Zilina, a nearby city, and lived there until after Thomas turned 5. Then, his father took the family across the border into Poland. On September 1, 1939, they boarded a train heading for a boat that would take them to England. But the German army invaded Poland that day, and their train was bombed. They joined other refugees, and walked north to Kielce. 1940-45: In Kielce the Buergenthals were put into a ghetto and then a labor camp. 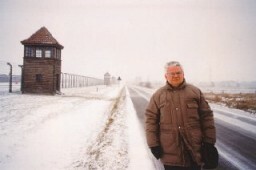 In 1944 Thomas was deported to Auschwitz with his parents. It was now January 1945, and the advancing Soviet army forced the Germans to evacuate. Thomas and his family were marched out—children at the front. Day one was a 10-hour march and tiring; they began to lag. Stragglers were shot, so Thomas and two boys devised a way to rest as they walked: They'd run to the front of the column, then walk slowly or stop until the rear of the column reached them. Then, they'd run ahead again. Thomas was one of only three children to survive the three-day death march. He was deported to Sachsenhausen, where he was liberated by Soviet troops in April 1945.